When its cold outside we prefer to eat warm or hot food, such as soup, potaje, stew, legumes and chestnuts in Spain; or fondue, raclette and croûte in the Swiss alpine villages. But, are these the best dishes to consume in winter? Traditions are wise and traditional foods usually adapt to the climactic conditions of different countries. But sometimes, other circumstances determine what the traditional food is. For example, the scarcity of food in winter. This would be the case for rösti, fondue and raclette. These dishes originated to make use of the scraps of stale bread and cheese by melting it and softening it with wine. In fact these dishes were often the meals in poor villages and nowadays has become a luxury food! The wine that is in the fondue and the croûte produces an effect of corporal warmth. And in general warm dishes produce a sensation of immediate internal bodily warmth. However, this sensation does not last long. After a few hours the effect of warmth will not depend on the initial temperature of the food but on the kind of food consumed. In general, foods that are rich in protein, such as meat, fish, eggs and dairy products, produce a stimulation of the heart and increases the blood flow to be able to eliminate the metabolic residues from the body, for example uric acid and urea. In the same way, the body tries to dispose of the alcohol toxic sub-products as soon as possible. (1) This activation of the circulatory system produces a sensation of bodily warmth. When digestion commences, there will always be a sensation of stupor that can be more or less strong depending on the person and the foods that have been consumed. This is why in Spain, it was usual to have a nap after lunch. This is because the blood and the energy from the organism concentrates on the digestive system, reducing the blood circulation in the brain and muscles. So a sensation of coldness is felt during digestion. Therefore, during winter it is better to have the main course after coming back home in the afternoon. Foods that are rich in complex carbohydrates, like legumes and grains, are known for providing energy slowly. But many studies show that the longterm effect of eating carbohydrates is disrupting blood circulation because of a phenomenon called glycation of proteins (2). Therefore, foods rich in carbohydrates are not adequate for winter. Even though legumes, chestnuts and rösti are very sought after in winter, they do not help us gain warmth, in fact the opposite is true. Fruits and vegetables first give a sensation of coldness but in the long-run the reaction they have in the body is neutral. They don’t stimulate or reduce the blood circulation. They are the ideal foods for our health. 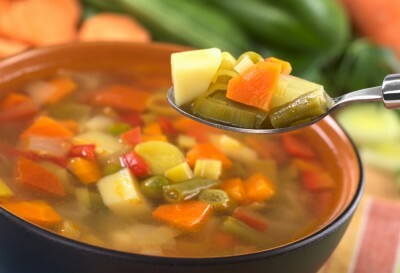 A vegetable soup or potaje can be one of the best dishes to have in winter, because they comfort us when being eaten and are healthy. Regarding fruits, even though the ideal is to eat them raw, it’s possible to prepare some warm foods made of fruits: baked apples, compote, fruit pudding, fruit casserole, fruit soup, etc. It is true that the larger majority of winter foods, both Spanish and Swiss, help heat us up in winter. But this doesn’t mean that they help to get our health any better. We have to consider that humans are designed to live in warm or hot regions, like the Mediterranean (1). The cold does bother us humans… and wanting to fix this problem eating foods that are not appropriate is not the best solution. If we don’t live in a warm zone we have two options: we continue with a healthy Mediterranean diet rich in fruits and vegetables and we suffer from the cold temperatures of winter, or we take the typical foods of colder countries and we damage our health. The best alternative is to eat warm foods made from fruits and vegetables that can comfort us when eaten and are healthy in the long-run.